Having used Arduino IDE to develope the ESP32 Utility Driver code I must admit that while I in general like Arduino I also miss a proper code editor. Sticking to Arduino (for now) I decided top try out Visual Studio Code. 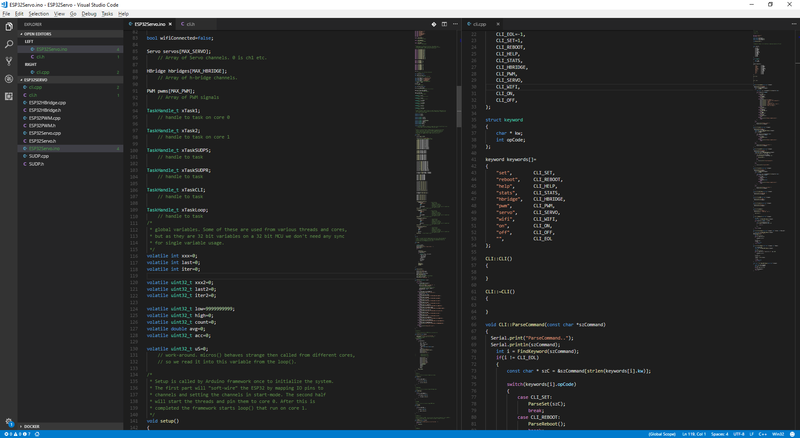 Visual Studio Code is basically a free and liteweight version of Visual Studio. In this case I just opened the folder and voila. This gives me the option to edit code here and use Arduino IDE to compile and upload. I am fully aware that more advanced options exist, but I intend to stick to Arduino libs on this project because they are straight forward to use. I actually have the full toolchain & ESP-IDF etc installed. This would probably be my own preferred ways of working, but I need something that every hobbyist can work with – no fuzz – with as little fuzz as possible. It’s other coder alternatives than Visual Studio Code. Friends of mine stick to Emacs etc. I learned years ago that you don’t mess with developers personal choises unless you want them frustrated and less productive. So whatever works for you is fine. A note on Arduino 1.8.5 is that it will not detect changes made by a different editor, so changes will be reverted if you save from Arduino after having changed a file from another editor.